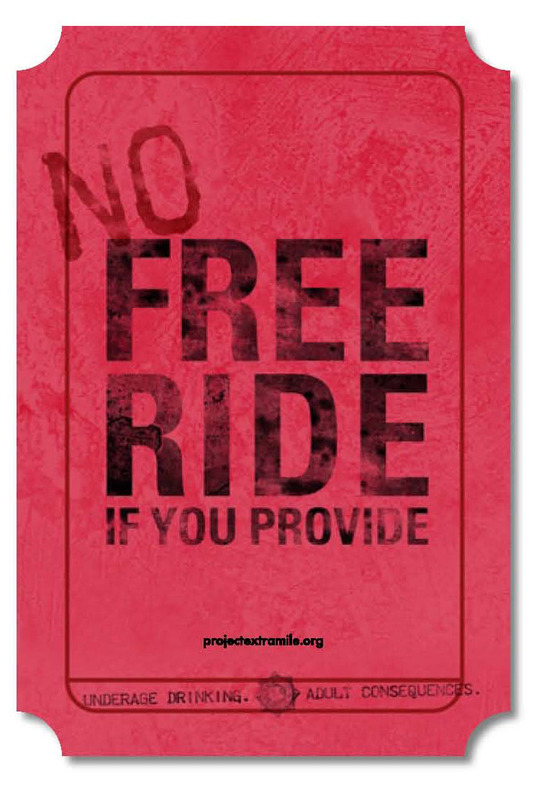 No Free Ride if You Provide is an education and awareness campaign targeted at adults. The campaign materials are intended to complement a community's increased enforcement efforts and ongoing policy initiatives to address youth access to alcohol by educating the community on the consequences of providing alcohol to minors. Under Nebraska law, adults who host an underage drinking party, or provide or sell alcohol to a minor, can be held civilly liable if the intoxicated minor injures or kills someone. That's right. You could lose your shirt, your house, your business. There really is no free ride if you provide. In addition, you can spend up to a year in jail, receive a $1,000 fine or both if you provide alcohol to a minor. If serious injury or death to any person is caused by the minor’s consumption or impaired condition, you can be convicted of a Class IIIA felony and will spend a minimum of 30 days and up to 5 years in jail, receive a $10,000 fine or both. Sometimes there is a free ride . . . to jail.